In a Nutshell: For many, not only can learning about credit and personal finance be intimidating, but it can also seem downright boring. With a little help from the experts at Creditnet.com, though, learning about your credit can become a lot easier — and more interesting. For over 20 years, Creditnet has been helping users understand their credit. The Credit Talk forum has been home to thousands of users asking and answering credit questions, resulting in around 500,000 forum posts. There is also a jam-packed Learning Center filled with guides to get you started, and the regularly updated blog has all the latest tips and offers. With the resources at Creditnet, you can become your own personal financial expert. Despite my current profession, I wasn’t always particularly fascinated with finance. In fact, my high-school self thought it was just plain boring, as many likely do at that age. When my economics teacher started going on about supply, demand, and gross national profit — well, my eyes would glaze over like a fresh batch of donuts. Unfortunately for me, that lack of interest in my money ended up getting me into a lot of trouble over the years, and my crash course in personal finance definitely earned the title “crash” — it came with a whole lot of painful credit bumps and bruises. 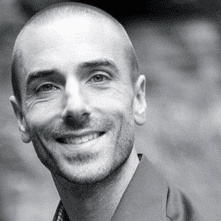 Joshua Heckathorn uses his MBA to help Creditnet readers understand their credit. Fortunately for you, the modern age and its world wide web of information makes it much easier (and more entertaining) to learn your financial lessons, without the metaphorical finance wounds. For instance, the experts and community at Creditnet.com have been sharing their credit enthusiasm with users for more than 20 years, answering questions and delivering engaging articles to help credit novices become credit pros. “Credit is not a very exciting topic for a lot of people, but I’ve always found it really interesting,” said Joshua Heckathorn, Creditnet’s President and one of its expert writers. His interest helps Josh while developing content, allowing him to better engage his readers, making it easier — and more enjoyable — for them to learn. Which is good, because there’s a lot to learn at Creditnet. Between the approximately 500,000 posts in the forums, the blog packed full of in-depth articles, and the Learning Center bulging with guides, Creditnet seems to have information on just about everything you need to know about your credit. If 500,000 sounds like a lot of posts, well, it is. The Credit Talk forum has over 25,000 members making new posts every day — and they’ve been at it for over two decades. That kind of activity adds up. Topics in the forum are obviously extensive, covering every aspect of credit, including bankruptcy, foreclosure, and how to rebuild your credit. “Anyone can come into the forum, introduce themselves, and ask a question or two,” explained Joshua. 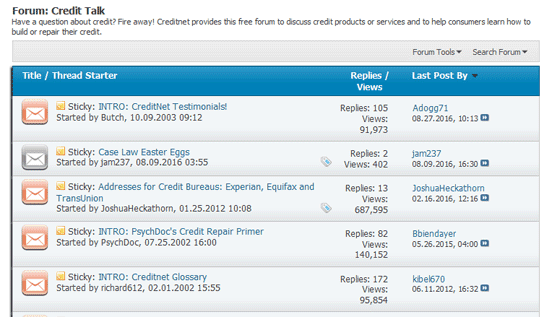 The Creditnet forum is home to thousands of members asking and answering credit questions every day. The experts and experienced community members who frequent the forums will quickly offer advice to answer your question — though you may want to do a quick search and see if the answer is somewhere in the archives. For those who are just getting started, the Learning Center is a great place to find helpful guides for getting a grip on your credit situation. Joshua recommends first-timers looking for help with their low credit score start in the DIY Credit Repair category. “There are 10 sections that talk about how to organize yourself, analyzing your credit report, writing dispute letters — everything you need to get started,” he described. The Creditnet Learning Center is a good place to start when you need help with your bad credit. The Center also has nine other areas, including the Credit Card FAQ and the Creditcents blog. The blog covers popular topics and frequently asked questions as well as the latest credit cards on the market. He believes you should have at least one card you use, and pay off in full, each month. This builds positive payment history and shows you can reliably pay your bill. “To get good credit you need to prove that you can manage credit wisely,” said Joshua. With years of experience answering questions from thousands of users, Joshua has seen his fair share of mistakes. He says the biggest one, though, is so many who fail to automate their payments. Most online banking systems will allow for automatic bill paying, and it can be set up to pay off your credit card each month. “You want to always pay in full each month,” said Joshua. Automating your payments is a great way to ensure you’re never carrying a balance. As your balance grows, so do your interest payments. See the table below to see the real cost of carrying a balance. Table 1: The time and cost to repay an initial $1,000 balance at 15% interest. As the table shows, paying just the minimum each month can lead to hundreds or thousands in interest fees, not to mention drastically extending the time it takes to pay off your loan. Pay off your card in full every month to avoid paying more for your purchases than you intended. Almost a cliché, the advice “live within your means” has been handed down by just about every grandparent everywhere. Well-worn advice or not, the fact is it’s much easier said than done, especially if your means are a little on the lean side. The key is to make a budget, stick to it, and try not to depend on credit to fill any gaps. “You essentially want to treat credit like cash,” advised Joshua. “You shouldn’t be buying something with credit for which you don’t already have the cash.” Many treat credit almost like free money, forgetting that it’s really debt, with many strings attached to it — like those hefty interest rates. Don’t give your credit a chance to get away from you; don’t charge it if you don’t have it. The next time you hear someone talking about the financial world, don’t channel your inner teenager by letting your mind wander and eyes glaze over. Instead, keep your focus sharp and your ears open — you can never tell when you’ll learn something you need to know. For example, did you know there’s a new type of FICO score? Joshua did. “There are a couple of exciting changes with the new FICO 9 score,” he revealed. “The new FICO score reduces the impact of medical collections, which will help a lot of people. Anyone can end up with a medical collection on their account, no matter how vigilant you are.” If poor health is behind your poor credit, this is good news for you.